ThronesDB has been updated with a variety of new features, fixes and other improvements. What follows are a several changes of note. The Kingdom of ShadowsKingdom of Shadows Neutral Agenda Plot deck limit: 1. You may include non-loyal characters with the printed shadow keyword from any faction in your deck. Increase the cost of each character you marshal by 1. Reduce the cost of the first character you bring out of shadows each round by 2. Beneath the Red Keep #79 agenda is now available for deck-building, its agenda-specific restrictions have been added to the deck validation engine. The list of agendas available in the New Deck wizard are now sorted alphabetically by title. All agendas from the Valyrian Draft Set have been removed from the wizard in order to tighten up that interface. The Conclave Neutral Agenda Plot deck limit: 1. Citadel. Conclave. Your deck may include non-loyal Maester characters from any faction. Your deck must include at least 12 Maester characters. Before placing setup cards, place the top 7 cards of your deck facedown under this agenda. Reaction: After you win a challenge in which you control a participating Maester character, choose 1 card under this agenda and switch it with the top card of your deck. House of Thorns #45 or Kingdom of ShadowsKingdom of Shadows Neutral Agenda Plot deck limit: 1. You may include non-loyal characters with the printed shadow keyword from any faction in your deck. Increase the cost of each character you marshal by 1. Reduce the cost of the first character you bring out of shadows each round by 2. 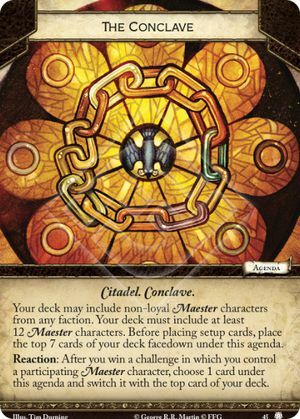 Beneath the Red Keep #79 agendas, which should make for a minor improvement to the deck-building experience by having all potential includes in one list without the need to click around first. Tournament tiers for published deck-lists have been updated and consolidated into the three official tiers Relaxed, Formal, and Premier. A fourth pseudo-tier Other is available as a catch-all. All preexisting options have been re-mapped in the following manner. A note on updating content in general – this was not a frivolous decision, but born out of necessity. I strive to refrain from altering user-submitted data. In this case, this seems like a reasonable, low-impact exception worth doing, as it allows us to move forward with development and to reduce maintenance overhead. On a related note, published deck-lists can now be filtered by tournament tier from the deck-list search form. That wraps it up for this round. As always, feedback of any kind is welcome, please see the contact information in the footer of ThronesDB.